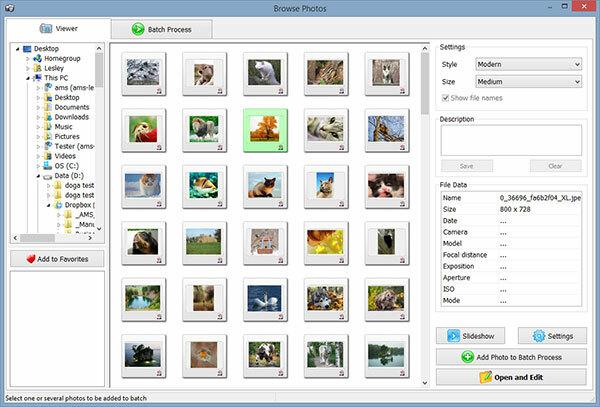 Home Photo Studio has a built-in photo viewer which helps you quickly find the necessary photos on your computer and external storage drives. There is support for all common graphic file formats, such as JPEG, BMP, TIFF, PNG, PSD and many more. Also, you can view EXIF data and add comments. 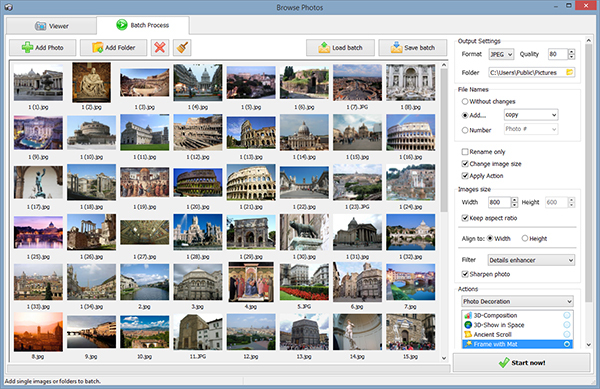 Do you want to rename multiple photos at once or convert a couple hundred of images to another format? Need to compress images or create thumbnails to publish on the Web? Home Photo Studio comes with a powerful module for batch processing. It is possible to choose from preset actions or create your own. Great way to speed up editing your vacation pics! Enjoy your photos using full screen slideshows! Home Photo Studio allows to view photos from any folder as a nice slideshow with a lot of transition effects.